A Taste of the Earth: oh the horror! My greenhouse access has been cut off!!! Even though I have no intention of being as ambitious with the sunflowers this year, there is a lot that I want to start from seed. Not only do I have tons of veggies that I want to do well this year, there are some perennials that want to get started because it will be two or more seasons before they start to flower. I almost wish I hadn't bought my seeds already so I could shift gears and go with starts from the farmers' market, but here they are... already bought... sitting by the computer like soon-to-be orphans because other official experiments have crowded the greenhouses and there's no room for us in the inn. So, you can see I'm in quite the pickle. 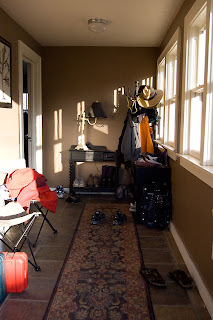 And, here's a picture of my "mud" room at the backdoor. I switched from a cold humidifier to a warm humidifier in the bedroom... so between that and an extra space heater, I'm going to try to make my own greenhouse. The upside to all of this is that I can see my "babies" more often. The trick will be restraining myself from over-watering... I'm like a little kid with a fish in a fish bowl who sprinkles in too much food. Ooh, can't wait to see what you come up with! Do you read: www.finnyknits.blogspot.com? She is one of my best friends and is a great gardener.